Colin Wheelock and Kedar Reddy just presenter their final posters at the Calit2 Summer Undergraduate poster session. 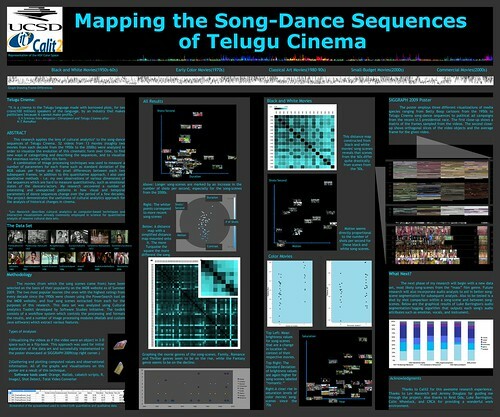 Kedar Reddy presented the poster "Mapping the Song-Dance Sequences of Telugu Cinema." The poster summarized his application of cultural analytic techniques to a collection of 52 video of song-dance sequences taken from 13 movies over the course of six decades (1950s-2000s). His visualizations included image scatterplots, dissimilarity matrices, audio classification bargraphs, hue sparklines, and other forms of information visualization. Kedar's work identified three periods of similar work, a trend towards greater diversity of form over time, and a few key outlier scenes that were highly dissimilar from the others. Colin Wheelock presented the poster "Understanding the Game: using image processing techniques to study video game play session." 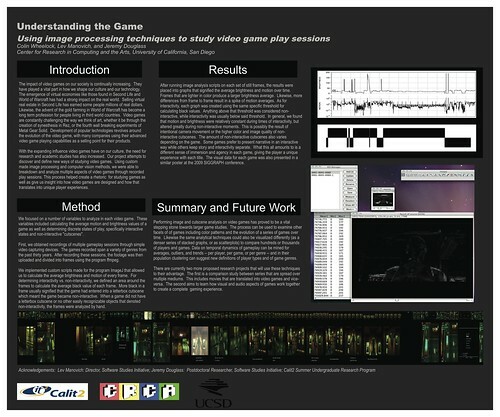 The poster summaries his analysis of 10 video games over the course of three decades, focusing how extracting basic feature metrics such as motion and color from gameplay, segmenting gameplay sequences by scene or shot, classifying shots by "interactive / non-interactive" modality, and summarizing and characterizing the variability and differences of interactivity in gampeplay over genre and time.